It can be difficult raising a young pirate in today’s society—it’s not quite like it was in the old days. Buried treasure isn’t just lying around in every beach. Treasure maps aren’t waiting around every corner and the real Tortuga Island is a nice little island near Haiti that’s totally not filled with pirates. And have you tried to find the Black Pearl for your child to command? It’s definitely no simple task! That’s why it’s good to have one part of the equation ready when trying to teach your child all the tricks of the trade, like this licensed Pirates of the Caribbean costume. With this kid’s Captain Jack Sparrow costume, your child gets the look of the most notorious rogue to ever sail the high seas. It comes with a white pirate shirt top with a printed vest. It also comes with sashes and belts attached at the waist. It even includes a pair of trusty pirate pants to accompany your child on their journey. Once your child puts them on, he’ll look just like the captain from the film, Dead Men Tell No Tales. 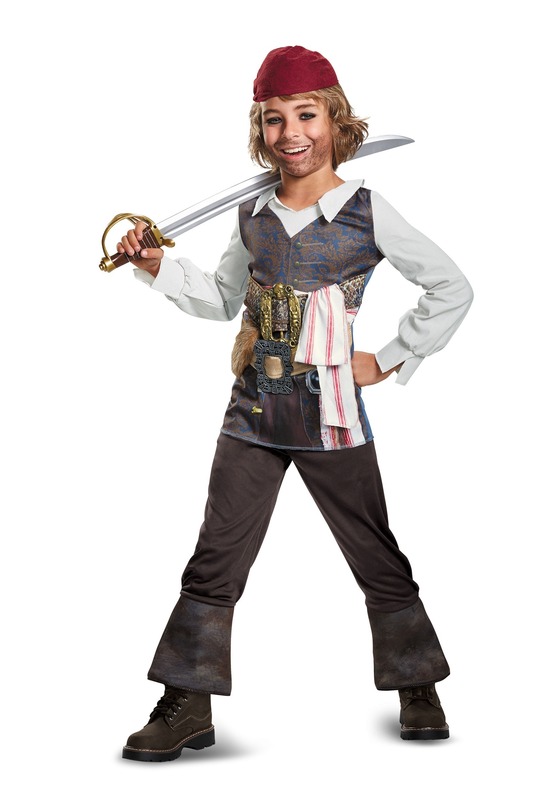 With this Pirates of the Caribbean costume, you can focus on teaching your child the important piracy lessons, like how to walk with fancy swagger like Johnny Depp. Or you can teach him how to use his compass to find the treasure of his heart’s desires. You can even teach him how to run from deadly foes like Davy Jones and even Captain Armando Salazar.